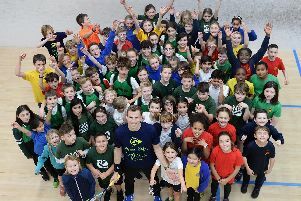 This September will mark two years since Matthew opened his own squash academy - based at the Hallamshire Tennis and Squash club - with the aim of helping talented young players progress their game to the next level. Matthew himself provides coaching in all aspects of the game alongside a team of staff who work alongside England’s most successful squash player day-to-day as part of his own professional set-up. The youngsters are also afforded the opportunity to practice with experienced professionals visiting the club to train. Now, nearly two years on, all of this is beginning to reap the rewards, says Matthew. “It’s going really well [the academy]. When we started we had two juniors that were ranked nationally in the country,” he said. “We had a decent junior set-up in terms of numbers but not many of them were playing around the country and in tournaments. “At that elite level I think we’ve gone from two juniors who had a national ranking to 26 now, including one national champion (Nick Wall - British Junior Under-17 champion) as well as a girl called Charlotte Jagger, who’s in the top five U19s in the country. Matthew now wants to continue this progress and outlined his ambitions for the future. “The goal is to try and turn Sheffield into the hub of squash in this country,” he said. “The academy is one part of that. The others are links with the universities to attract young professionals, getting an amazing schools programme and disability programme, potentially things going through to underprivileged kids with coaching, education and healthy eating alongside introducing kids to sport. The 36-year-old was awarded an OBE in 2015 for his services to squash. In a professional career spanning nearly 20 years, his commitment to the sport has never wavered. Therefore, the academy offers an opportunity to continue his long association with the game. “I was at the point in my career where I was ready to give something back. It helps me with a good focus off the court as well,” he said. “I think if you just wait until your playing career is over then you might take your time to set it up and then you sort of lose momentum. I wanted to do it while I was very much still an active player at the top of the game with a profile in the sport and a good team. Despite the commitment of the academy, Matthew’s own playing ambitions haven’t suffered. He has set his sights on competing at the 2018 Commonwealth Games in Australia, and hasn’t ruled out adding to the three gold medals he has previously won at the tournament. “That’s probably something that I’ve been looking at as a bit of a swansong, not just to make up the numbers,” he said. After his playing days conclude, however, continuing to help the next generation of players will take centre stage. “My involvement will get more and more hands-on as my playing career goes swanside,” said Matthew. “Hopefully what I’ve done in starting it when I did was give me the opportunity to then really build on the platform that it’s already got when I retire. “Sheffield’s a really sporting city, we want to capitalise that on squash. What is clear is that Matthew will continue to be an active ambassador for the sport long after he steps back from playing the game professionally. Although he feels publicity for squash has improved, in time he hopes it can get more of the widespread recognition it deserves. “I think it is definitely growing. It doesn’t get the profile of football, cricket or rugby, tennis with Wimbledon on right now of course but it doesn’t do too bad,” he said. “There’s lots of sports that are in the Olympics that haven’t got the successful tour and don’t get the publicity we get. “We’re just trying to build it all the time, we try and see the glass being half-full, rather than half-empty and keep trying to grow it little by little.